Sheffield FC travel to Peterborough Sports knowing its almost job done with their Division One South safety all but mathematically secured. Eleven points from six games under interim boss Chris Dolby has seen Club climb up to 18th, eight-points ahead of bottom of the table Market Drayton Town, more importantly six ahead of Romulus who have just three games remaining and have a far inferior goal-difference. Irrespective of Thursday night’s scheduled trip to Belper Town and at also Peterborough on Saturday, Dolby’s side will be safe if Romulus fail to win at Lincoln United at the weekend. “We’re almost there,” said Dolby. “The points tally we’ve put on the board since I’ve taken over means it in our hands. Which is what we wanted and that’s down to the players, I cant fault the efforts. We’ve taken 11 points from six games, which was something we needed to get us out of trouble. In that time we’ve lost just once against Leek Town, which was down to a bit of tiredness. But then we’ve bounced back with a draw against Cleethorpes; every point does really count. WWe want Evo-Stik Football here next season, it’s important to this club and its future that we retain that status. When it’s finally confirmed then we can start planning for next season. We’re almost over the line, we just need to see it through then get as many points as we can from remaining games. It’s unlikely that Dolby will remain in the role of manager next season. Sheffield beat Peterborough 3-2 at home at the beginning of September, coming from 2-0 down at the break with goals from Richard Adams and a James Gregory brace in what provided their first win of what has been a difficult campaign for the worlds oldest club. 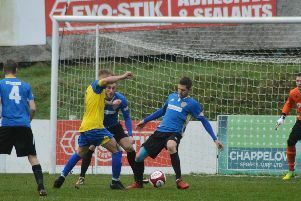 Stocksbridge Park Steels’ promotion hopes may be over for another season but they can still have a say in the race for an automatic promotion place. Chris Hilton’s side go to second-placed Alvechurch who have a two-point cushion over Bedworth United in third. They are a further point clear of Frickley Athletic in fourth ahead of their scheduled visit to Bracken Moor last night. Steels drew 3-3 at Gresley FC on Tuesday after coming from two goals down to lead 3-2 late on only to be quickly pegged back. Frickley are also in with a shout of the second automatic promotion slot but face a difficult test against leaders and already promoted Basford United, at Westfield Lane. FIXTURES: Premier Division: Mickleover Sports v Buxton, Shaw Lane v Lancaster City, Whitby Town v Matlock Town. Division One South: Alvechurch v Stocksbridge Park Steels, Frickley Athletic v Basford United, Peterborough Sports v Sheffield FC.